S. juzepczukii (juzepczukii, in honor of Russian botanist Sergei Vasilievich Juzepczuk) is perhaps better included among the cultivated species than the wild, but as a wild species hybrid, the dividing line isn’t entirely clear. This species is treated more like a wild species in breeding programs. This species is cultivated primarily in the highest elevations of the Andes in Peru, Bolivia, and northern Argentina, where S. tuberosum ssp. andigenum will not survive due to frost. Plants grow about 12 to 14 inches tall, although some take a more wild-type rosette form. Stolons of some varieties are rather long, as much as 18 inches, although most are more like domesticated potatoes. 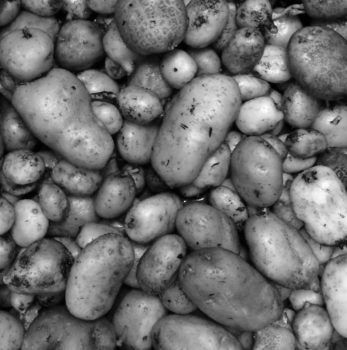 Tubers are similar in size and form to stenotomum type andigena varieties. Most varieties have blue skin and some have blue flesh, less commonly white skin and yellow flesh. Flowers usually blue. S. juzepczukii is high in glycoalkaloids and is only consumed after processing into chuno. The origin of S. juzepczukii is believed to be as a hybrid between S. acaule and diploid S. tuberosum ssp. andigenum (S. stenotomum). S. acaule is tetraploid but 2EBN, while the stenotomum type diploid parent would have been diploid and 2EBN. They are compatible because they have the same EBN, but the cross of a tetraploid and a diploid results in triploid progeny. Like most triploids, S. juzepczukii is effectively sterile, although it is able to cross to species with higher ploidies. So, for example, while S. juzepczukii does not self-pollinate or cross with other varieties, it can be crossed to tetraploid S. tuberosum ssp. andigenum. S. juzepczukii has been “artificially” synthesized by crossing the putative parent species. I’m not sure why this hasn’t been done more often. It is much easier than crossing S. juzepczukii to domesticated potatoes. Osman (1978) found that total glycoalkaloids ranged from 11.7 to 46.8mg/kg, so this species straddles the generally accepted safety limit of 20mg/kg. Some varieties are edible fresh, while others must be processed to reduce glycoalkaloid content. Crossing S. juzepczukii to S. tuberosum ssp. andigenum produces tetraploids (Ochoa 1990).